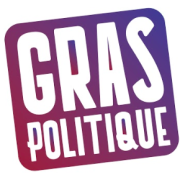 Gras Politique is a feminist and anti-fatphobia non profit founded in 2017 in Paris, France. In march 2019, we'll be having our first Fat Festival : 2 days to shine a light on fat people and their talents, on how to fight fatphobia, on how to care for oneself in a society that hates your body. This is a first time event for France, and our first Fat Festival at Gras Politique. We want to raise money to pay for the travel expenses of people coming to talk or teach or perform at the Festival and to be able to pay those who will be working for our entertainement during the Festival at a fair price. The Gros Festival will take place on March 23rd and 24th at Le Pavillon des Canaux, in Paris, France. We need financing to be able to pay for our talents, speakers and performers travels, and to be able to pay some of them. We are feministe, queer and anti fatphobia. We are located in Paris, France. We work with fat people, we educate others and we lobby.